This launch event includes a Twitten Treasure Hunt with the chance to win a copy of the New Encyclopaedia of Brighton. For children there will be badge making, colouring, puzzles and creat a Butterfly Feeder. By finding out about your local twittens you can discover new things about your area. Many of the twittens follow old drovers routes – some even link up to help you walk large parts of the area without having to go near a road. They are often a short cut to the local shop or the bus stop. So there are lots of good reasons to go ‘Twittening’. Where can you get a twitten map? Editor’s note: Sorry to those of you who have tried to access copies of the map. I have reported the problems to the relevant council department, and hope they will be resolved soon. In the meantime here below for you to download, is a pdf version which is not as large as the original, but will allow you to see how it will be presented. 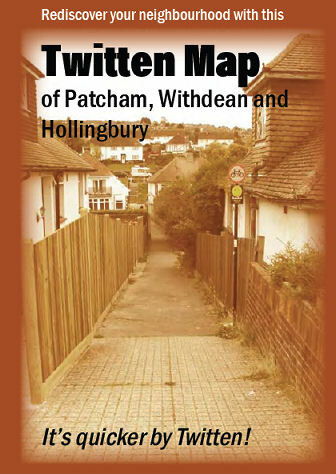 I tried the link to brighton-hove.org and searched for twitten and got nothing. I typed Twitten Maps and found a site that wants me to install some map program (maps.alot.exe) which of course I do not want to do. If there is a downloadable Twitten map how do I get it? Trying to activate downloading copies from http://www.brighton-hove.org.uk search for ‘Twitten’ but have been usuccessful. Am I doing something wrong or just jumping the gun and trying too early because the map has yet to be put on the site? Great little map! There are also much older twittens around the Blaker’s Park / Cleveland Road area that I remember. Great short cuts that give interesting panoramas of back yards (gardens). There must be loads of others across the older parts of Brighton and Hove. Looks like an interesting artefact! Of course the ultimate twitten in Brighton is Lennox Street, aka The Cats’ Creep: see the MyB&H page for this here. We also have twittens where I now live in Bath, but we call them “drungs”. No idea why. In Yorkshire, twittens are known as ‘ginnels’.